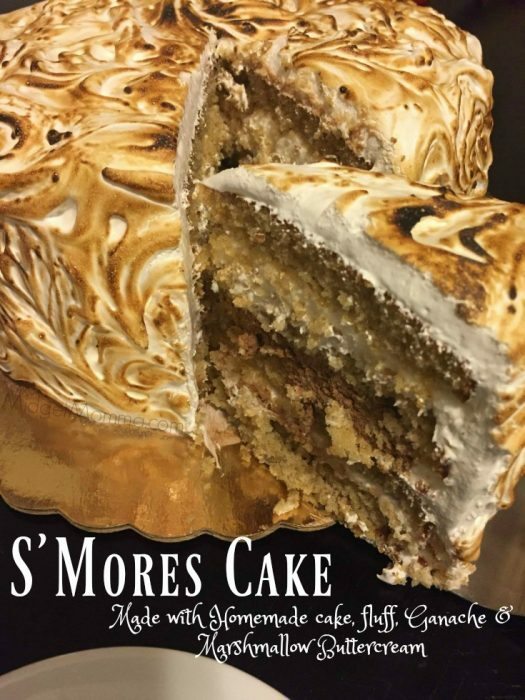 If you love the amazing combination of chocolate, marshmallow and graham crackers then you are going to love this S’mores Cake! It was one of our friends 30th birthday and of coarse I was in charge of making the cake. I was torn between making him a iron man cake or making a really fun flavored cake. Well I deiced to go with the fun flavored cake because they are always having us over for a bonfire in their back yard. We all know that with a bonfire comes s’mores. 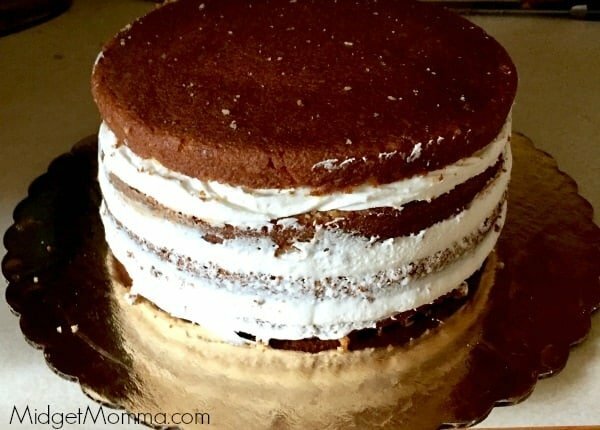 This was my take on a few different recipes put together to make this S’more cake. 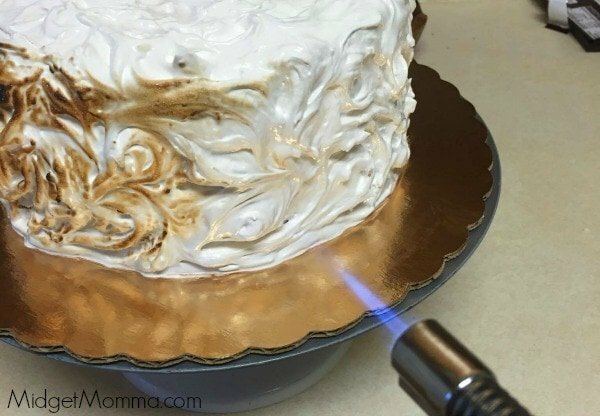 For this recipe you will need the Marshmallow Buttercream and the Marshmallow Fluff Here is a great article on the tools used to decorate cakes. Grease Two 8″ can pans and lightly flour the pans making sure to tap out any extra flour. In a medium bowl whisk together the graham cracker crumbs, flour, baking powder, baking soda and salt. Cream the butter, brown sugar and granulated sugar together on medium high speed until light and fluffy, about 3 minutes. Turn the speed down to medium and slowly incorporate the eggs one in at a time. With a rubber spatula scrap down the sides of the bowl and add in the vanilla. Alternate mixing the dry ingredients and the buttermilk into the batter until all the ingredients are well incorporated. Evenly divided the batter between the two cake pan. Bake for 50 to 60 minutes or until a tooth pick comes out clean from the middle. While your cake is baking and cooling make your Ganache (Using directions below), Marshmallow buttercream and Homemade Fluff . 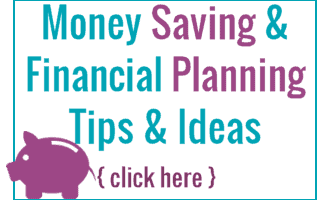 Chop up your chocolate into small pieces and place it in a heat safe bowl. In a small sauce pot bring the heavy cream just to a boil. Pour it over the bowl of chocolate. Cover the bowl with plastic wrap and let the cream sit on the chocolate for a minute. Stir the ganache in small circles until the cream and the chocolate are fully combined. Place in a 9×9 pan to set up. Now it is time to put this amazing cake together! Slice the cakes in half so you are left with four layers. Place your first layer of cake on your cake board or plate. Spread half of the marshmallow buttercream on that layer of cake. Top the buttercream layer with a layer of cake. Spread the ganache on top of that layer. Top the ganache layer with a layer of cake. Spread the last half of the buttercream on that layer. Top the buttercream with a layer of cake. Spread the fluff all over the outside of the cake making sure its all even. Hold your torch about an inch away from the fluff and carefully brown the outside. If you love baking and are looking for more amazing and tastiness check these out! I made this cake and am wanting to assemble it, but the ganache is runny. I used 6 oz of Hershey milk chocolate bar and 6 oz heavy cream. Is the Hershey bar not just the ordinary milk chocolate eating bar? I’m not sure what to do. I wouldn’t use the Hershey milk chocolate I have never had any luck with my ganaches with that kind. Yet their dark chocolate one normally works for me. The cake is a good gooey dessert. I’m not sure what kind of milk chocolate I should have used because I used a Hershey bar and it would not set up. So, I used a tablespoon of unflavored gelatin and that worked. I wouldn’t recommend using a Hershey bar for some reason I never have luck with that kind of chocolate. Great save with the gelatin! The reason you won’t be super successful if you use a Hershey’s bar, any other bar for matter, is because it’s already been tempered… You need virgin chocolate… Such as chocolate chips, baking chocolate… Etc.